Robert Mueller has spent two years investigating Trump and he hasn&apos;t said a word. It&apos;s possible he never will. WASHINGTON - Occasionally, his signature appears on court documents. But on the most consequential days of the nearly two-year investigation into Russia's interference in the 2016 election, the man leading it - Robert Mueller - has been conspicuously absent. Mueller's investigation has cast a shadow over nearly all of the first two years of Trump's presidency. Prosecutors working to determine whether Trump's campaign coordinated with Russian efforts to sway the election that put him in office have brought charges against some of his top aides and revealed extensive Moscow ties. But as the inquiry grinds closer to its conclusion, there are signs that the public might never learn the full extent of what Mueller has - or hasn't - found. Justice Department rules require that Mueller submit a confidential report when his work is done. William Barr, the man likely to be confirmed as his next boss, has cast doubt on whether he would permit that document to be revealed. And those who know him say Mueller, reluctant to speak publicly even when the circumstances seem to require it, is unlikely to do it on his own. "A public narrative has built an expectation that the special counsel will explain his conclusions, but I think that expectation may be seriously misplaced," said John Pistole, who served as Mueller's longtime top deputy at the FBI. "That's not what the rules provide, and I really don't see him straying from the mission. That's not who he is." The Justice Department's special counsel rules don't call for Mueller to make any public statements about his work, let alone deliver a report of what he has found. Instead, his confidential report must explain why he filed the charges he did, and why he might have declined to bring charges against others. It would be up to the attorney general to decide whether that becomes public. Barr, who is widely expected to be confirmed this month as attorney general, told lawmakers he couldn't commit to releasing Mueller's report in full. Neither was he clear on whether he would permit Mueller to testify to Congress about his work. He said he wanted to be transparent about Mueller's findings, but offered few details. After Barr's testimony, Sens. Charles Grassley, R-Iowa, and Richard Blumenthal, D-Conn., introduced legislation that would require a special counsel to provide a report directly to Congress in addition to the attorney general. For any other major player in official Washington, where outsize egos routinely clash for political supremacy or simple adulation, such a scenario would be unthinkable. But Mueller's aversion to the spotlight has been consistent across a lifetime in public service, from the battlefields of Vietnam to the office that now represents perhaps the most serious threat to the Trump presidency. "None of this has ever been about his ego," Swecker said. "He relishes the work as much as he hates the fanfare. It's never been about him; it's always been about the work." Just as he transformed a maligned FBI in the aftermath of the 9/11 attacks into his own image as a meticulous investigator, the Russia investigation has come to embody Mueller's unflagging, buttoned-up personality. "He's not a warm and lovable guy," Swecker said. "If you work for him, you are never going to feel appreciated. Things move too fast for that. He believes that you signed up to do a job. And it's your mission to get it done. He doesn't like drama." Mueller's team appears to have embraced that approach. His prosecutors have brought charges against 34 people and three companies including Trump's former campaign chairman Paul Manafort; his first national security adviser, Mike Flynn and his former personal attorney, Michael Cohen. And outside of court filings, they've had nothing to say about any of them. When the team won a jury verdict after a three-week trial against Manafort, prosecutors retreated to their offices rather than appear at a clutch of microphones outside the courthouse. Asked by email if they had any comment, Mueller's spokesman responded with a single word. Pistole, who served for six years as Mueller's deputy at the FBI, describes his former boss as "totally apolitical," with an unmatched work ethic. "For him, it was about what is right for the country," Pistole said. "Nothing else." 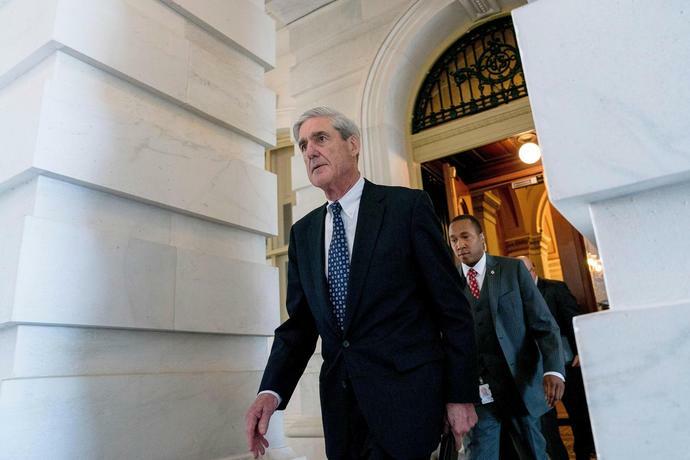 Mueller exited the FBI in 2013 as the longest-serving director since J. Edgar Hoover - amassing a legacy best defined by a grind-it-out style that kept the FBI intact. "And I mean that in a good way," Chertoff said then. After the FBI, Mueller stayed on the public stage, but seldom in the spotlight. As a partner at the high-powered law firm of Wilmer Hale, Mueller's clients included some of the most recognizable corporate brands, including the National Football League. The NFL hired Mueller in 2015 to examine the league's handling of a domestic violence incident involving then-Baltimore Ravens running-back Ray Rice. When it was complete, the 96-page report, which cleared the NFL of any intentional improper conduct, was simply posted online. No press conference; no public appearance by Mueller to discuss the findings. In a surprise turn of events, Mueller was among those Trump interviewed to replace his ousted successor at the FBI, James Comey. Instead, Deputy Attorney General Rod Rosenstein appointed Mueller in May 2017 to head the investigation into Russian interference in the 2016 election. Since then, the public has had only occasional glimpses of Mueller. One photo captured him waiting for an airplane at Ronald Reagan Washington National Airport, just a few yards away from an oblivious Donald Trump Jr. The photograph immediately went viral, a measure not only of the chance passing of the two potential adversaries, but the intense interest in the intensely private man leading perhaps the most widely watched criminal investigation in a generation. It was months before Mueller's appointment as a Russia special counsel when Pistole last had an extended visit with his former boss. At the time, Pistole said he was surprised to encounter a "jovial" Mueller, a feature that few have ever witnessed in such an outwardly serious character. "He had been away from government for a while," Pistole said. "He was laughing and joking. I thought: 'Who is this guy? What have you done with my director?' I doubt he's had many moments since he took this job." Barr has suggested that if the Senate confirms him, the public is unlikely to hear from Mueller directly. Barr, who served as attorney general in the administration of George H.W. Bush, has made no secret of his allegiance to the chain of command. In the midst of the 2016 campaign, he objected to then-FBI Director Comey's decision not to recommend criminal charges against Democratic nominee Hillary Clinton for her use of private email server while Secretary of State because he said the decision should have been left to the attorney general or the deputy attorney general, not the chief investigator. Barr told lawmakers he would "provide as much transparency as I can consistent with the law" about what Mueller's investigation concludes. But he also cast doubt on how much detail he would be able to reveal. Justice Department rules require only that he notify Congress about instances in which he had overruled Mueller's decisions about how the investigation should be handled. Some of the facts Mueller has gathered could be the result of grand jury proceedings, which are required by law to remain secret. And he pointed to a Justice Department policy to avoid publicizing "derogatory" information about people who aren't charged with a crime. Senate Democrats have expressed concern that the policy, combined with the department's view that a president cannot be indicted, could lead Barr to keep confidential parts of the investigation that relate to Trump. "If the attorney general doesn't issue a public report, they can expect it to be subpoenaed by Congress because of the high public value of Americans understanding just what the Russians did and who worked with them," said Rep. Eric Swalwell, D-Calif.
Last month, acting Attorney General Matthew Whitaker raised expectations when he told reporters that Mueller's work was "close to being completed." "I hope we can get the report from Director Mueller as soon as possible," Whitaker said then, only to suggest last week in testimony before the House Judiciary Committee that even he wasn't really sure of the timing and hadn't received a report. "Bob Mueller is going to finish his investigation when he is going to finish his investigation," Whitaker told lawmakers. But some are casting doubt that a substantial final report from the special counsel is even in the offing. "He's a federal prosecutor; they don't write public reports," said George Washington University law professor Randall Eliason, a former federal prosecutor. "Everybody is breathlessly waiting for the Mueller report and I'm not sure that one is even coming." This article originally appeared on USA TODAY: Robert Mueller has spent two years investigating Trump and he hasn't said a word. It's possible he never will.